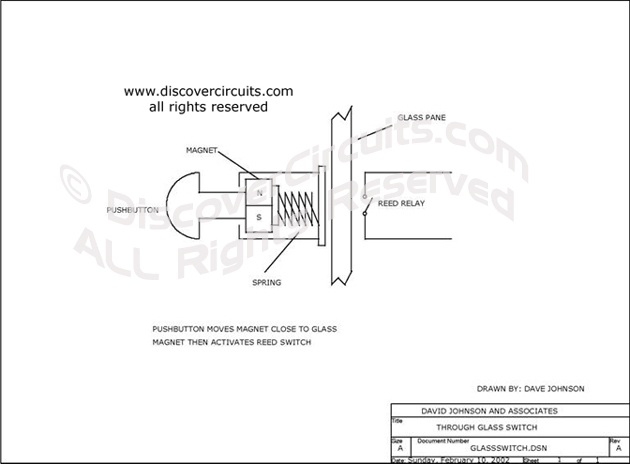 Circuit: THROUGH GLASS PUSHBUTTON SWITCH __ Circuit designed by David A. Johnson, P.E. This simple technique allows a mechanical pushbutton switch assembly to activate a reed type relay through a pane of thick glass. Pushing the button moves a magnet near the reed relay, closing the relay contacts.